Honeybee colony collapse drives price of honey higher and threatens fruit and vegetable production. WASHINGTON (CNN) -- Beekeepers throughout the United States have been losing between 50 and 90 percent of their honeybees over the past six months, perplexing scientists, driving honey prices higher and threatening fruit and vegetable production. At a House Agricultural Subcommittee hearing in Washington, D.C., today, members of various organizations came together to share their concerns about what they have been calling the "Colony Collapse Disorder," or CCD. Honeybees have been mysteriously dying across the United States, sending honey prices higher and threatening the agriculture industry. Beginning in October 2006, beekeepers from 24 states reported that hundreds of thousands of their bees were dying and their colonies were being devastated. In December 2006, beekeepers' associations, scientists and officials formed the CCD working group, in hopes of identifying the cause and solving the problem of CCD. Most of the beekeepers who have recently reported heavy losses associated with CCD are large commercial migratory beekeepers, some of whom are losing 50 percent to 90 percent of their colonies. 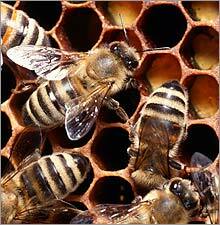 Moreover, surviving colonies are often so weak that they are not viable pollinating or honey-producing units. Losses have been reported in migratory operations in California, Florida, Oklahoma and Texas, but in February some larger keepers of nonmigratory bees, particularly from the mid-Atlantic region and the Pacific Northwest reported significant losses of more than 50 percent. Testifying in front of the committee this morning, Caird E. Rexroad, from the Agricultural Research Service, said that although his agency has a variety of theories as to what might be causing CCD, it believes stress on the bees might be the major motive. "We believe that some form of stress may be suppressing immune systems of bees, ultimately contributing to CCD." The main four types of stresses that Rexroad identified were migratory stresses, mites, pathogens and pesticides. And the impact goes far beyond direct bee products like honey and wax. Three-quarters of the world's 250,000 flowering plants - including many fruits and vegetables - require pollination to reproduce. Dr. May R. Berenbaum, head of the department of entomology at the University of Illinois, believes the economic impact of the decline in bees could be disastrous. "Though economists differ in calculating the exact dollar value of honeybee pollination, virtually all estimates range in the billions of dollars," she told representatives at the House hearing. But this is not a new problem. Over the past two decades, concern has risen around the world about the decline of pollinators of all descriptions. During this period in the United States, the honeybee, the world's premier pollinator, experienced a dramatic 40 percent decline, from nearly six million to less than two and a half million. In 2005, for the first time in 85 years, the United States was forced to import honeybees in order to meet its pollination demands. Berenbaum says that "if honeybees numbers continued to decline at the rates documented from 1989 to 1996, managed honeybees ... will cease to exist in the United States by 2035."